MSF surgeon Cristiana Bertocchi recounts her time performing surgeries in the only functioning hospital in northern Abidjan during a period of intense fighting. 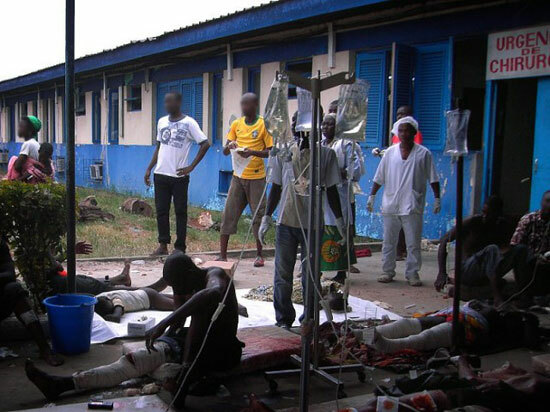 Abobo Sud hospital the day of the attack at the nearby market, when the facility was flooded with wounded people. Doctors Without Borders/Médecins Sans Frontières (MSF) Surgeon Cristiana Bertocchi recently finished a short stint in Ivory Coast, during which she worked in the Abobo Sud neighborhood of Abidjan. The city is one of the main flashpoints in the widespread and worsening violence in the country. At present, the Ministry of Health hospital in Abobo Sud, where MSF is working, is the area’s only fully-functioning hospital and one of the few in the city. Medical teams there have treated 273 emergency patients over the past three weeks, 225 of whom had bullet wounds. Can you tell us about Abobo Sud hospital? The hospital is in the most volatile neighborhood of Abidjan, and for the most part that neighborhood has been abandoned. When you take the road from the house, the base we had in Abidjan, to the hospital [in Abobo] it was winding roads of nothingness: no one on the streets; burned-out car carcasses on sides of road; barricades in different areas. Sometimes armed people would be manning barricades and would come out and question and threaten you. Within the hospital itself, fortunately, there was no violence. But we were close to it, and there was gunfire outside the hospital walls. Gunshots would be heard any time throughout the day, and it could persist for quite some time and be very nearby and sound as if it were actually within the hospital walls. We would all run for cover when that would occur. What sorts of injuries were you treating? I wasn't at hospital every day of the week but in the first 48 hours, we had between 15 and 20 patients per day with a variety of gunshot wounds. Several were quite severe. Within first 24 hours, I had two patients who were shot multiple times in the head, for which we could do nothing. Were you getting a few people at a time or large numbers all at once? There was one incident on March 17 which made international news. I guess a missile was fired into a market in Abobo. About 60 or so patients were brought to the hospital. Eight were already dead on arrival and I think another eight died during triage. We had one operating room fully functional and going nonstop. A second operating room we were able to open up; however, we only had only one anesthesiologist, so we were limited in how much we could do. The ones that came with that mass casualty were men, women, some children, mostly with blast wounds. Some were quite severe. We had a woman whose arm was essentially torn. The muscle was torn off. She was left with a big hole in her upper arm. Fortunately, it did not hit any of major vessels or break any bone. We had another guy with mangled hand and several with deep abdomen wounds that required surgery. One died on table from an aortic injury. What was it like inside the hospital? 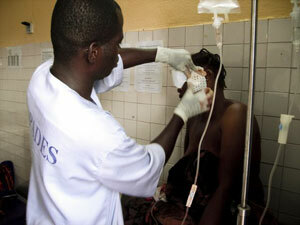 An MSF staff member attends to a patient at Abobo Sud hospital. It was extremely stressful because you had many patients that you were trying to triage and many patients to get in and out of operating room. You're triaging those people who look likely to survive against the ones that are not. And there are ones that we might have been able to save back home, under calmer conditions, but in a mass casualty situation you probably couldn't because there are so many you have to deal with at the same time. If they had been coming individually instead of mass situation, you would have been able to do something for them, and that was definitely a difficult thing to deal with. At same time, you have no idea what is outside, security-wise. And you feel you and the hospital grounds are at risk at any moment. It was pretty continuous. With that mass casualty we were running at full capacity 48 hours straight. Otherwise with other incidents we pretty much operated until 11, 12, 1 in the morning. Then we’d have a few hours break before starting up again in morning when sun came up and more injuries started coming in. Was it quieter at night? There weren't too many that would come in middle of night that required surgery. That goes with situation at night: people are afraid to travel. There wasn’t quite as much shooting going on within the vicinity at night. We would hear of some things going on further away. What were some of the other procedures you were doing? We did do a lot laparotomies—I think averaging four or five laparotomies a day—open abdominal surgery for a variety of injuries inflicted by gunshots. We had several bowel injuries, injuries to bladders, liver injuries. We also did some C-sections, emergency c-sections. We did have a maternity ward with two midwives who assisted. For women unable to deliver vaginally we took them to the OR. We had a lot of fractures, open fractures, open bullet wounds requiring debridement, and then fractures that resulted from bullet wounds that also required debridement and fixation. Our success rate as far as patients we took to OR and their survival and expected prognosis seemed to be pretty good. But, again, there were a lot of patients. Going back to first 24 hours, I had two with bullet wounds to head. We also had two other patients with gunshot wounds who seemed perfectly stable on arrival, and 15 minutes later, they were dead. We couldn’t get them to the OR fast enough because there was already a case going. I can only guess at what their internal injuries were. Based on the bullets wounds one person had, I’m guessing a vena caval or hepatic vein injury. Injuries that are difficult to deal with even in a sophisticated trauma center. And with all of the violence we would hear going on outside hospital walls, you can only guess how many more patients out there never made it to hospital. Had you been in an environment like this before? No, I've not. And from what I could understand, of other international staff I was working with, even for them this was very unusual as far as situations MSF works in. It was extremely stressful and difficult for all of us to work and provide the quality of care we felt we were able to provide under normal circumstances. It sounds like your previous stint in Ivory Coast with MSF was quite different. Well, my first time was essentially the end of the conflict in 2006. And we were passing back the mission hospital to the Ministry of Health. It was totally peaceful. So, completely different climate and different situation this time around. It did not compare in any way at all. Last time, was doing emergency general surgery. This time I was doing emergency trauma surgery. MSF is a medical humanitarian organization that observes strict neutrality and impartiality in its operations. Its activities in Ivory Coast are funded exclusively by private donors, ensuring its complete independence. MSF is working in Abidjan, providing emergency medical assistance with the collaboration of the Ministry of Health in the Abobo Sud hospital . In the western part of the country, it is providing primary healthcare services and supports hospitals in Duékoué, Guiglo, and Bangolo. MSF also provides primary healthcare services in Nimba County, Liberia, where large numbers of Ivorians are seeking sanctuary from the violence in their homeland.